Robert Silverwood is one of the men named on the Bottesford ‘church list’ of WW1 Servicemen, and was also one of those recorded on the Absentee Voters list: Robert Charles Silverwood, High Street, Private 41247 16th H.L.I. (though his Service Medal Roll entry clearly states the 17th Battalion). Robert Charles Silverwood was born in Redmile on the 26th July, 1892 . According to the 1911 census, he lived at home in Redmile with his father Tom Walter Silverwood (49, tailor maker and post master), and mother Jessie Louisa Marshall Silverwood (47). He was the fourth youngest out of the five children living at home at this time. He was 18 years old, at work as a poultry keeper. The other children were Arthur Edward (24), a tailor maker like his father, Florence Anne (23) a postal assistant, Ethel Eliza (21) and Cecil Tom (12, at school). There was also a cousin, 5 years old Thomas Rhead Carlton, who was also at school. Before WW1 he advertised in the Grantham Journal as Redmile Poultry Farm and was a keen poultry keeper, entering local shows. According to the absentee voters list, Robert Charles Silverwood served as a private in the 16th Highland Light Infantry, no. 41247. However, his record in the WW1 Service Medal and Award Roll clearly gives his unit as the 17th Battalion. 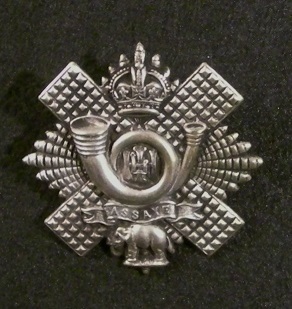 This indicates that he was entitled to the Victory Medal and the British War Medal. To date, no further service record has been found. The 17th Battalion of the Highland Light Infantry, also known as the 3rd Glasgow, was formed in 1914 by the city Chamber of Commerce. It was part of the 97th Brigade of the 32nd Division, which was part of Kitchener’s 5th New Army and made up largely of ‘Pals’ battalions. After landing in November, 1915, the Division was engaged in many of the major actions in France from 1916 to 1918. It is not clear why a man from Redmile was posted to this Regiment. He married Hannah Mary Hilda Mather, known as Hilda, on 31st January 1923, at St Mary’s parish church, Ilkeston, Derbyshire. In the obituary (Grantham journal Friday 24th February 1950) of his father Tom Walter Silverwood, who died in 1950, it was stated that Mr R.C. (Robert Charles) Silverwood was the postmaster in Ellesmere, in Shropshire. Robert’s older brother, Arthur Edward, became a parish councillor at Bottesford, and his younger brother Cecil was another postal worker, becoming postmaster at Renfrew in Scotland at the time of his father’s death. Tom Silverwood had been postmaster in Bottesford for 37 years, and on his retirement in 1944 had been succeeded by his eldest daughter, who with her sister ran the post office for a long time afterwards. Robert Charles Silverwood died in September 1974 aged 82 in Oswestry, Shropshire. Details of Robert Silverwood’s birth and marriage were found in public family trees made available by Ancestry.co.uk, in particular the Hyndman and Silverwood Family Trees.